Mammal fossils were first discovered in 1901 in the Fort Union Formation of the Crazy Mountain Basin, Montana, and large collections were made at a number of localities over the next few years. 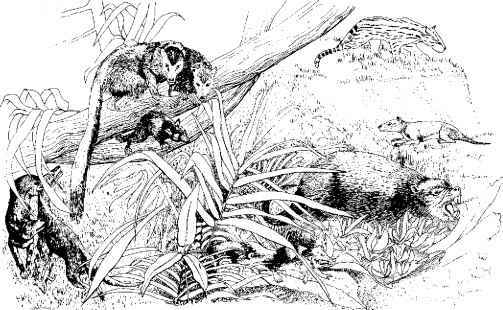 Simpson (1937) described a typical fauna of 79 species from the Gidley and Silberling Quarries (see illustration), dominated by multituberculates such as Ptilodus. Some of the mammals belong to familiar modern groups, such as the early lemur-like animal Plesiadapis (see p. 353), the shrew-like insectivore Stilpnodon and the cat-like carnivore Didymictis. The other mammals belong to wholly extinct groups, the insect-eating leptictid Prodiacodon, the pig-like taeniodont Conoryctes and the sheep-sized pantodont Pantolambda. The Fort Union fauna contains no large mammals, a feature typical of the Palaeocene. Very few exceeded sheep-size. Further, although some of the groups present are still with us today, most (about 75%) are wholly extinct. This fauna is a dramatic glimpse of an early experimental phase in the radiation of the mammals. The Crazy Mountain Basin contains sediments spanning much of the Palaeocene, the Torrejonian, Tiffanian and Clarkforkian mammal ages (Bown and Rose, 1990). The land mammal ages are further subdivided so that dating is precise to units averaging 0.6-0.7 Myr in duration. Mammal fossils are hugely abundant throughout, with yields of 772 and 1205 specimens from the Douglass and Scarritt quarries, for example. Krause and Maas (1990) used the rich succession of the Crazy Mountain Basin to study the rates of appearance of new mammals and to investigate their geographical origins. They found that there were dramatic turnovers of mammal genera at the start of each of the land mammal ages. At the Torrejonian—Tiffanian boundary, 13 new genera appeared, including insectivores, plesiadapids, arctocyonids, a hyopsodontid, phenacodontids, and a pantodont. At the Tiffanian—Clarkforkian boundary, nine new genera appeared, including the first rodents, tillodonts and coryphodontid pantodonts in the area. At the following Clarkforkian-Wasatchian boundary (early Eocene) in the Bighorn Basin of Wyoming, 16 new genera appear, including the first perissodactyls, artiodactyls, adapid and omomyid primates, hyaenodontid creodonts and didymoconid 'condylarths'. Over the years, palaeontologists have suggested a variety of geographical origins for the mammals of the Western Interior of North America. 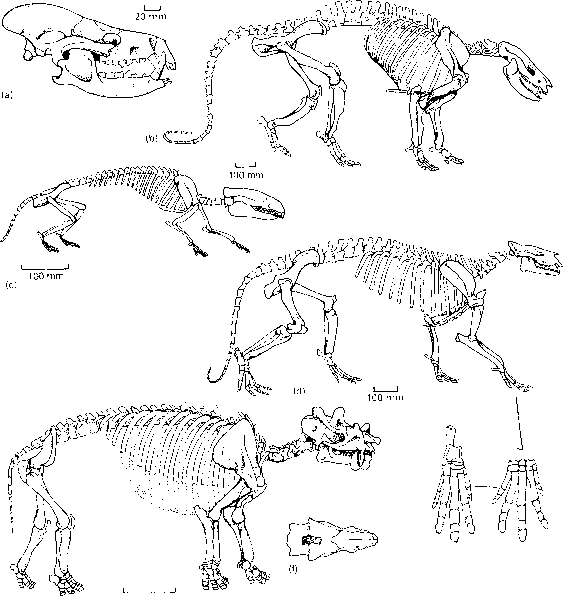 Krause and Maas (1990) find that the new mammals in the Tiffanian had probably evolved in situ, whereas those in the Clarkforkian, especially the rodents and tillodonts, had probably migrated across Beringia from Asia. The new mammals in the Wasatchian (perissodactyls, artiodactyls, adapids, omomyids, hyaenodontids) appeared at the same time in Europe and Asia and they may have had their origins in Africa or in the Indian Subcontinent. and a possibly prehensile tail. Arctocyonids fall in the clade Cetartiodactyla, close to its origins (O'Leary and Geisler, 1999). 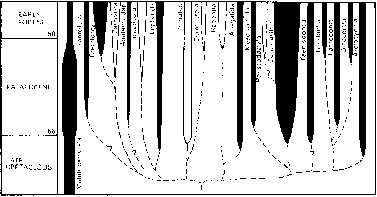 The 'condylarths' are an assemblage of five or six distinct lineages at the base of the radiation of later ungulates (Gazin, 1968; Prothero et al., 1988). 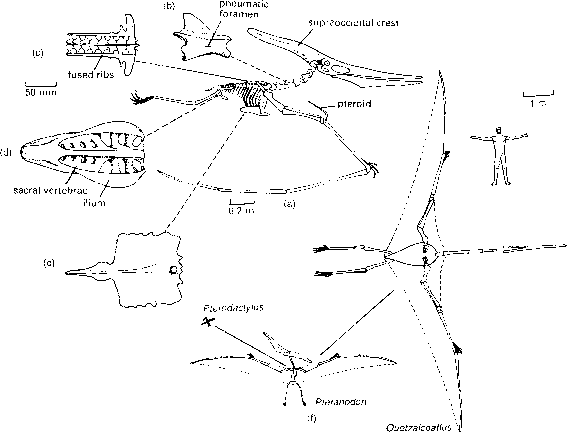 The periptychids, such as Ectoconus (Figure 10.27(b)), were common in the Palaeocene. The massive crushing teeth indicate a pig-like omnivorous diet and the skeleton is generally primitive: the hands and feet each retain five digits and all the wrist and ankle bones are present. The hyopsodontids, such as Hyopsodus (Figure 10.27(c)), arose in the Palaeocene and were abundant in the early Eocene. These were small, short-limbed animals that may have lived semi-arboreally. 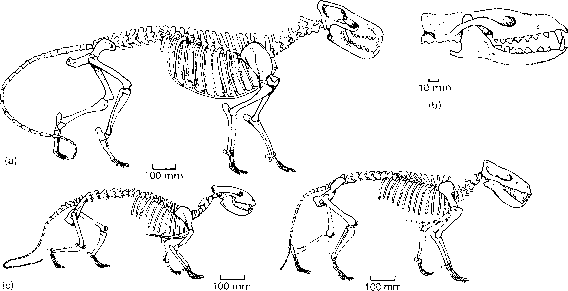 The phenacodonts of the Palaeocene and early Eocene, such as Phenacodus (Figure 10.27(d)), often interpreted as close to the ancestry of horses, are sheep-sized and the limbs are short and primitive. The outer toes are shorter than the middle three and the cheek teeth have broad surfaces for crushing fruit and slicing leaves, as is seen in early horses (see p. 346). The largest mammals in the late Palaeocene and early Eocene were the dinoceratans, or uintatheres, of North America and Asia. Uintatherium (Figure 10.27(e, f)), a late-appearing mid-Eocene form, is as large as a rhinoceros and has bony protuberances on its head. Males have canine teeth 150 mm long, which may have been used in fighting, a possible explanation for the bony bumps. Uintatheres have small, tapir-like cheek teeth that were used to deal with plant food, and their brains are unusually small (Figure 10.27(f)). Uintatheres appear to be unrelated to specific modern ungulate groups (Prothero et al., 1988). drewsarchus from the upper Eocene of Mongolia, has a vast skull, 830 mm long and 560 mm wide, larger than any other known terrestrial carnivore, and in life it must have been a terrifying 5-6 m or more long. Mesonychids are probably close relatives of whales (O'Leary and Geisler, 1999) or of cetartiodactyls as a whole (Gingerich et al., 2001; Thewissen et al.,2001). The creodonts, the main meat-eaters in North America, Europe and Asia in the early Tertiary, ranged from stoat- to bear-sized. 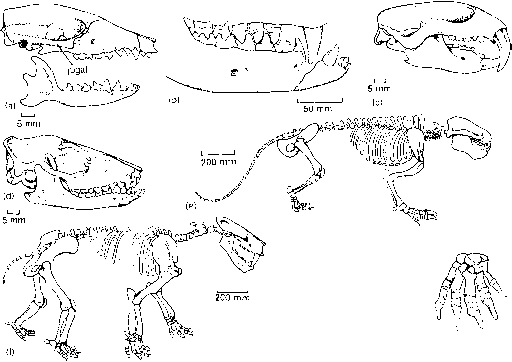 Sinopa, an early fox-like creodont (Figure 10.28(b)), has a low skull and all of its cheek teeth are sharpened for cutting flesh. Oxyaena (Figure 10.29(c)), a rather cat-like animal, has a long body and short limbs, retaining five toes on each plantigrade foot. Hyaenodon (Figure 10.28(d)),representing a different creodont group, was larger, and some of its relatives reached bear size. This wolf-like animal was the only creodont to survive the late Eocene, living in Africa and Asia until the Late Miocene. Cladistic analyses (Polly, 1996) suggest that the 'creodonts' are probably a polyphyletic assemblage, including relatives of the modern Carnivora (see p. 348), as well as other lines with no living relatives. In North America, Europe and Asia, the placental mammals underwent a rapid radiation during the 9 Myr of the Palaeocene (Rose, 1981; Figure 10.29). The 15 or so lines of extinct mammals just described diversified widely in the northern hemisphere. In addition, several living mammalian orders also arose in the Palaeocene, the insectivores, true carnivores, dermopterans ('flying lemurs'), bats, primates, perissodactyls and rodents. The other modern orders all arose during the subsequent 19 Myr of the Eocene. The global diversity of mammalian families rose from 21 in the latest Cretaceous to 37 in the early Palaeocene, 86 in the late Palaeocene and 111 in the early Eocene (Stucky and McKenna, 1993). New calculations show that the radiation in North America was explosive (Alroy, 1999), with a rapid rise in the numbers of genera across the continent, as well as in the diversity of individual faunas. Fig. 10.29 The radiation of boreoeutherian mammals in the Palaeocene ofEurope and North America, showing two phases, one in the latest Cretaceous to earliest Palaeocene and one in the late Palaeocene, as far as the fossil record indicates. Groups that are now extinct are shaded black, extant orders are left blank: this shows the extent ofthe early proliferation of diverse groups that became extinct soon after. ing the Palaeocene and early Eocene is usually treated as one of the best-known examples of an adaptive radiation. It is assumed that the placentals had some key adaptation, such as extended parental care, greater intelligence, or more diverse feeding and locomotory adaptations, that allowed or even drove the radiation. As far as we know, little direct competition took place between the dinosaurs and the mammals, and the radiation of the latter was purely opportunistic. It is probable that the intelligence, adaptable dentitions and extended parental care of the placentals allowed them to radiate more rapidly into a broad range of niches during the Palaeocene than say the frogs or the lizards, which might equally well have taken over the world. Indeed, crocodilians (see p. 237) and ground-living birds (see p. 281) radiated as carnivores during the early Tertiary, but eventually gave way to the mammals.